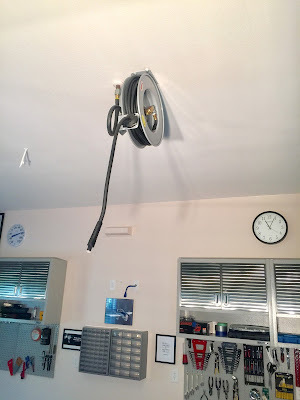 Power and air hose reels mounted near the (future) EAA workbenches. 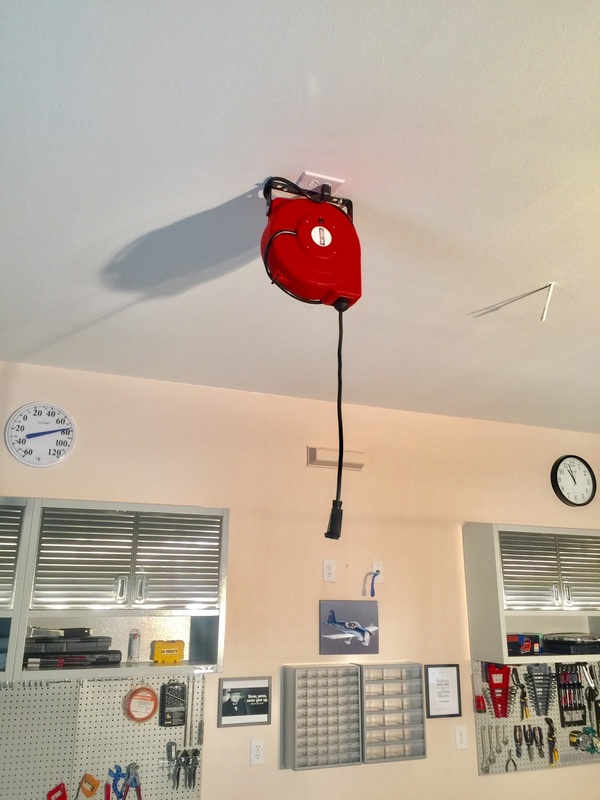 I planned for these during construction by adding an electric plug and a 1/2" black iron air line from the compressor location. The wire protruding from the ceiling between the reels is one of nine Romex drops for the nine LED light fixtures that are yet to be installed. From previous experience a well lit workshop is a happy workshop! 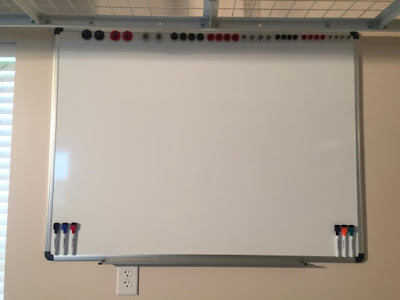 Mounted a 3' X 4' Dry Erase Board above the (future) desk location. I need to get the floor epoxied now because Iv'e just about mounted everything I can think of on the walls and ceilings. Assorted magnets across the top. The markers have built in magnets and erasers on each marker. I wonder how many parts will be listed here that need to be reordered because of my learning curve?!!! Added two small part storage bins today. Until I epoxy the floor everything I'm doing is on the walls or the ceiling! Used a discount coupon to buy these Stack On Organizers at Northern Tool today.There will be a continuous work bench under everything and the flat screen TV above. I'll need to reference this throughout the build! 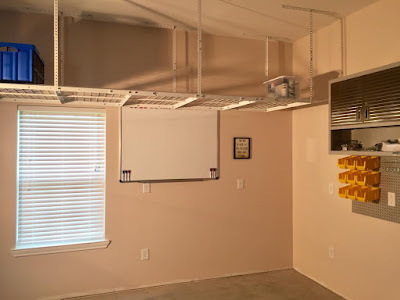 So in shopping around I decided on the "Seville Classics Ultra HD" line of storage cabinets, overhead cabinets, pegboards, work benches and accessories. Not only because of the reviews but also the price. I also found the best price by far was through Sam's Club. These overhead cabinets were well packaged, had great assembly instructions and also came with the tools needed for assembly! 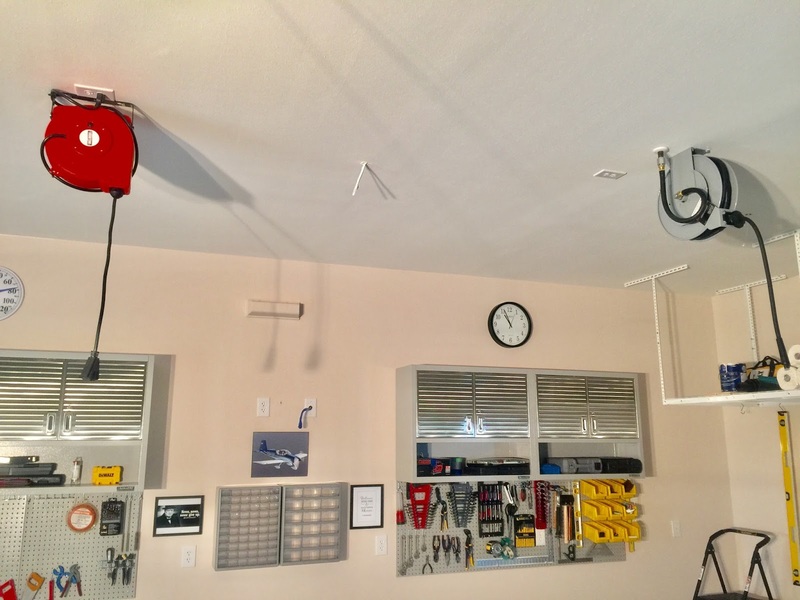 Seville Classics Ultra HD overhead cabinets and pegboards. General shop tools on the right and (future) aircraft tools on the left. This workshop will also be a Man Cave, so it's pre wired for the 55 inch smart TV to be mounted between the cabinets! The clock is a LaCrosse Technologies 14" Atomic clock purchased on Amazon. Unlike other clocks it runs on one, two or three AA batteries for an extended run time of 3 years. 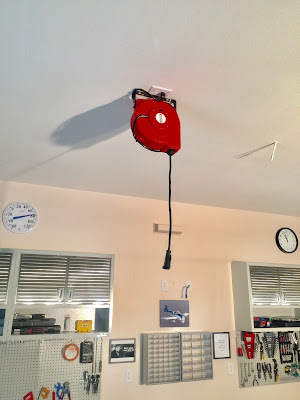 Just put the batteries in and forget it, accurate to the second and automatically adjusts for Daylight Savings Time. Next up is to epoxy and clear coat the floor. Then storage cabinets, workbenches (including 2 eaa benches), power tools and air compressor. My goal is to have the workshop completely setup before ordering the aircraft tools and empennage. As I stated in the beginning this is a slowww build, and that's OK!